Starting as a quiet drama about identity and obsession, along the lines of While You Were Sleeping, this Danish noir thriller drifts more towards Vertigo as it develops. And then it breaks into pure ironic terror. Even though it's sometimes contrived, it's utterly gripping. Forensic photographer Jonas (Berthelsen) narrates his own story, Sunset Blvd-style, through a series of flashbacks. After rescuing the helpless, beautiful Julia (Hemse), he allows her family to think he's her boyfriend. He knows he should tell the truth, but the mystery is too inviting, and when she wakes from her coma, her memory and vision cloud her understanding. The problem is that Jonas is married to Mette (Fich), and as he obsesses over Julia he begins to forget who he really is. The narrator in writer/director Ole Bornedal's Danish thriller Just Another Love Story -- a film that's probably too aware of its genre signifiers -- rhetorically asks the audience "A beautiful woman and a mystery. Isn't that how any film noir starts?" Indeed that's true, at least for the better ones. And for a time, Bornedal's cheerfully dark story hits the right admixture of seductive danger that it doesn't matter how many other films and books it might remind you of. Bornedal at least knows his noir well enough to remember that the more accomplished genre entries don't just have a femme fatale with a past, they also feature a grade-A schnook, the kind of bona fide sap who believes everything a dark-haired beauty tells them and thinks he can handle himself. They never can. Bornedal's sap is Jonas (Anders W. Berthelsen), a police crime scene photographer who lives with his wife and two children in some dead-soul Copenhagen high-rise that he can't afford and still smells of paint. It's a grim life, photographing dead people while his colleagues make self-consciously bad jokes and his midlife crisis churns in overdrive. But Bornedal -- after a stylized opening sequence that tosses out a trio of teaser scenes, including one showing Jonas bleeding to death in the rain -- doesn't do much with Jonas' ennui before throwing the other woman at him and cranking up the noir. It's a whopper of an entry, with Julia's car smashing into Jonas's, after which she slips into a coma and awakes with no memory to find Jonas saying that he's her lover Sebastian, whom her family had heard about but never met. In the first of several hard-to-swallow developments, Jonas is mistaken by Julia's family for Sebastian when he shows up at the hospital to check up on her, and he never corrects them -- he's got a fatale to fall for. In 1995, Danish directors Lars Von Trier and Thomas Vinterberg established a code of ethics for an alternative form of filmmaking. The two directors were fed up by the way in which movie making was "raped" by technology such as special effects, expensive gear, cranes, filters, dollies, and spotlights. They wisely knew that they could never measure up to the Americans in that area, so they decided that European filmmaking should head in an all-together different direction. The result was a vow of chastity complete with the ten commandments of what they called Dogme filmmaking. Some of these groundbreaking rules included: on location shooting without the ability to bring in props, the rule that music will not be used unless it occurs where the scene is being shot, the camera must be hand-held, optical work and filters are forbidden, and the films must not contain superficial action such as murders, weapons, etc. The purpose was to force a director to think along unconventional and imaginative lines in order to create a Dogme film, and the first two attempts, Vinterberg's The Celebration, and Von Trier's The Idiots, were both successful. 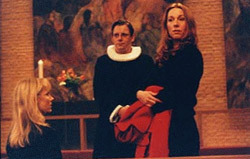 Director Soren Kragh-Jacobsen's Mifune, is the third film from the Danish Dogme Collective. Subtitled in English, it is the story of Kresten (Anders W. Berhelsen) who has become an overnight sensation as a businessman in Copenhagen. The morning after his wedding to the boss' daughter, he receives a phone call that his estranged father has just died. He has trouble explaining this to his wife, since he has told everyone in the city that he has no living relatives, in attempt to disguise his humble origins. Now he must return to the family's run down farm to bury his father and make arrangements to hide the truth of his mentally retarded brother from his new family and friends. The film takes place in a squalid Copenhagen suburb where emotions and anxiety seemingly run amok. While the actual narrative is simplistic, it profiles six desperately needy and complicated individuals looking to fulfill themselves. When a recently widowed (and young) pastor named Andreas (Anders W. Berthelsen) arrives on the scene to take over the duties for a wayward congregation, he finds himself catering to the interests of a half dozen disillusioned individuals trying to make sense out of their empty lives.